'Funk Ain't Dead,' Long Live Funk Art! Peter Selz, director at the time of UC Berkeley’s University Art Museum, organized a 1967 show simply titled Funk, gathering artworks he described as irreverent in attitude, committed, bizarre, sensuous and “frequently quite ugly.” As if this "definition" wasn't nebulous enough, the term Funk itself was borrowed from jazz, which necessitates an extra layer of explication to differentiate the visual art from the musical genre. But Selz’s definitions of Funk, often positioned against the minimalist and finish-fetish work popular in New York and Los Angeles in the late '60s, still hold true—at least for the collection of messy, weird, gooey and colorful artwork gathered at San Francisco's Root Division for Funk Ain’t Dead, a group show curated by local ceramics artist Matt Goldberg. 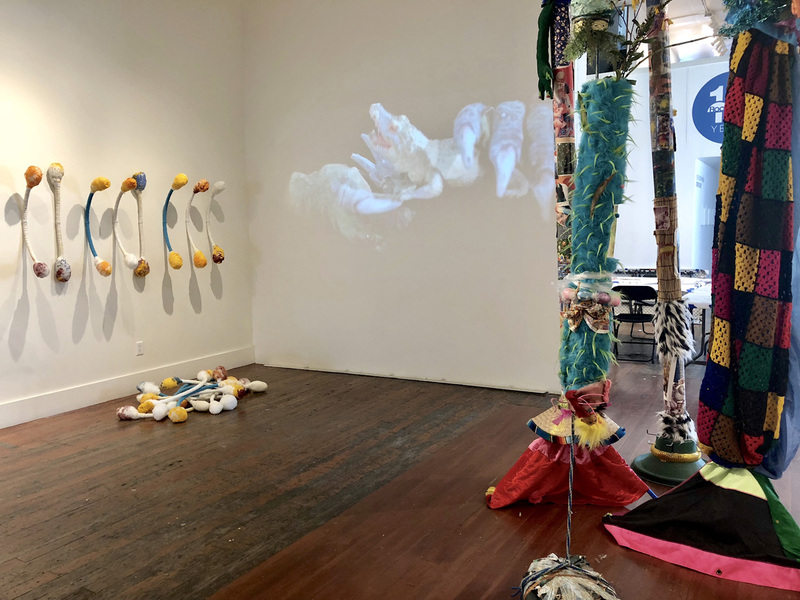 Five decades after Funk, Goldberg finds the spiritual descendants of the movement-that-never-really-was in 21 Bay Area practitioners, demonstrating how contemporary work can exist under a moniker used so long ago—and why we still need that art. 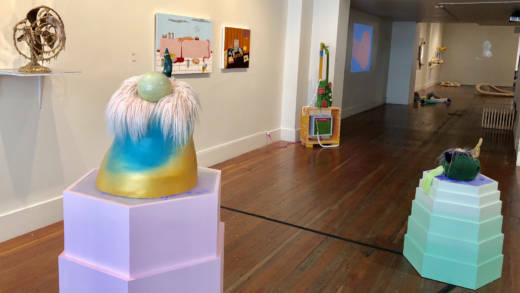 While 21 artists sounds like a lot of work (it is), Root Division’s high-ceilinged Mission Street space accommodates the paintings, sculptures and videos of Funk Ain’t Dead without feeling overcrowded—a feat considering their aforementioned weirdness and gooey-ness. The show opens with Santiago Insignares’ Tender Cage #3, a wall sculpture made out of foam tubes ending in cast hands and chain-link fencing boxed in by thick wooden frames. 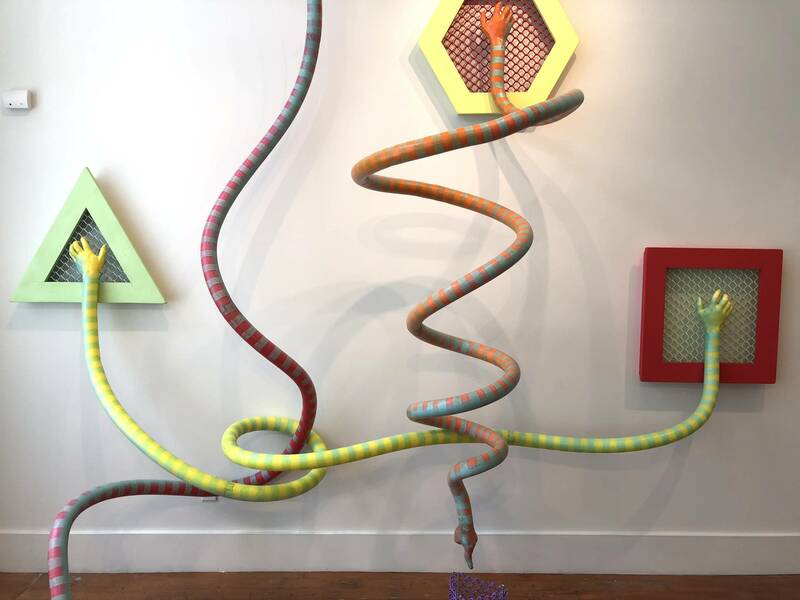 In his original exhibition essay, “Notes on Funk,” Selz wrote, “Funk art looks at things which traditionally were not meant to be looked at.” And sometimes those "things" are political. It’s impossible to see Insignares’ work without thinking of family detention centers; the one “cage” on the gallery’s floor holds a child’s toy truck. Other works directly or suggestively touch on the anxiety of our current times, living up to Selz’s determination that “Funk is visual double-talk, it makes fun of itself, although often it is dead serious.” Elisabeth Kohnke’s video Crisis Flag shows an inflated tube (the kind that frequently adorn car lots, also known as “skydancers”) flopping violently about with the Stars and Stripes at its top. Ian Mackay’s animation Nail Biter is a simple, yet extremely relatable 10-second loop of a pink-headed person forever chomping on their own fingernails. In 2018, we are all Nail Biter. In the back gallery, the things “not meant to be looked at,” are of a more corporeal nature. 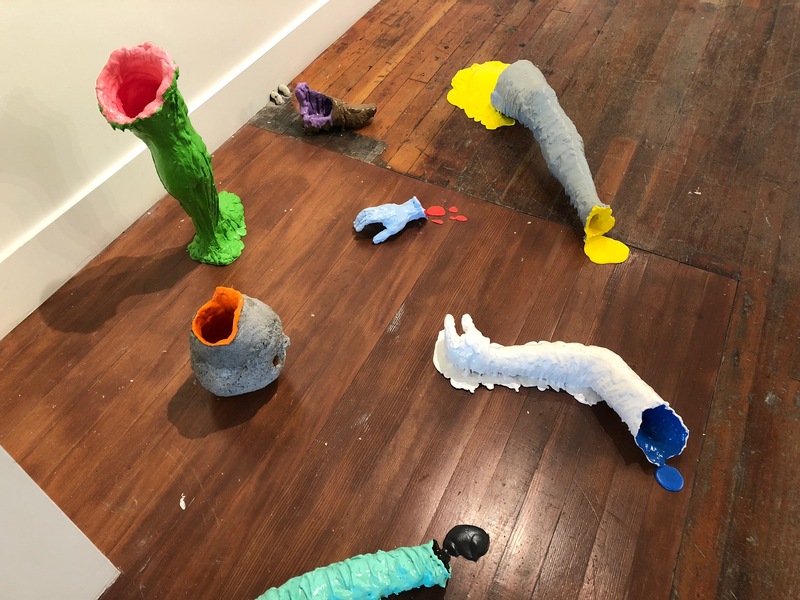 Lee Lavy’s Body Without Organs sits on the gallery floor like a collection of dismembered cartoon body parts, each gloopy cast of a hand, leg or foot painted brightly and oozing out a contrasting color. Nearby, David Lasley’s series of oil on paper paintings show squeezed and distorted images of men’s bodies in lurid “feminine” tones, abstracting human forms that are already highly unreal (pictures of male models sourced from the internet). But the artists of Funk Ain’t Dead prove that, despite these long-ago protestations, Funk is an attitude that lives on, bringing us new, confident, potent and defiant ways of looking obliquely at an already-ridiculous world, one gloopy object at a time. 'Funk Ain't Dead' is on view at Root Division in San Francisco through Aug. 11, 2018. Details here.